Wild camping is one of the great joys of backpacking. Indeed for me it’s a main reason for backpacking. Every wild camp has its positive aspects, even if it is merely the relief of being inside a tent whilst a storm rages outside. Ideally though a wild camp should be in a spectacular location and the weather should be fine so you don’t have to be cooped up inside. 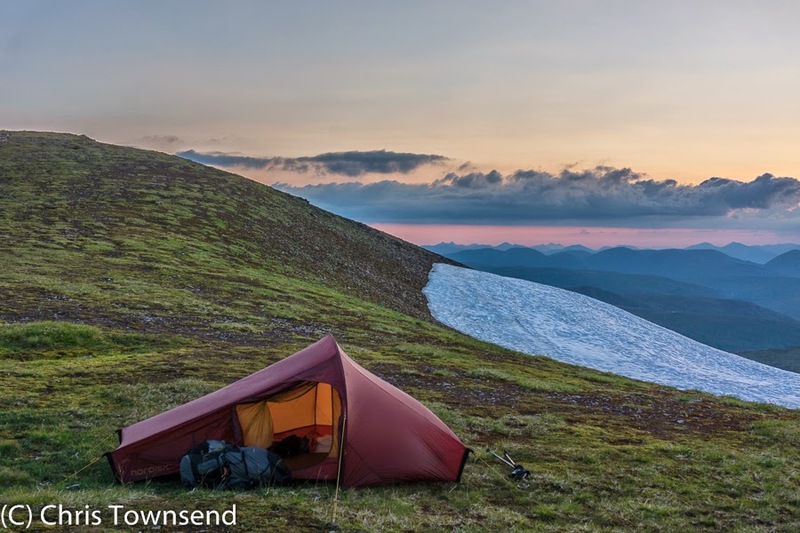 The most dramatic and stunning locations for wild camps are mountain tops and it is on these that I have had some of my most memorable nights. Of course mountain tops also have the wildest weather and are usually not places it’s easy to escape from in a storm in the dark. That in itself makes summit camps special and gives them an edge and sense of uncertainty that is rarely felt in low level camps. Mountain top camps are often unwise or impossible due to the conditions too and lower sites have to be sought. 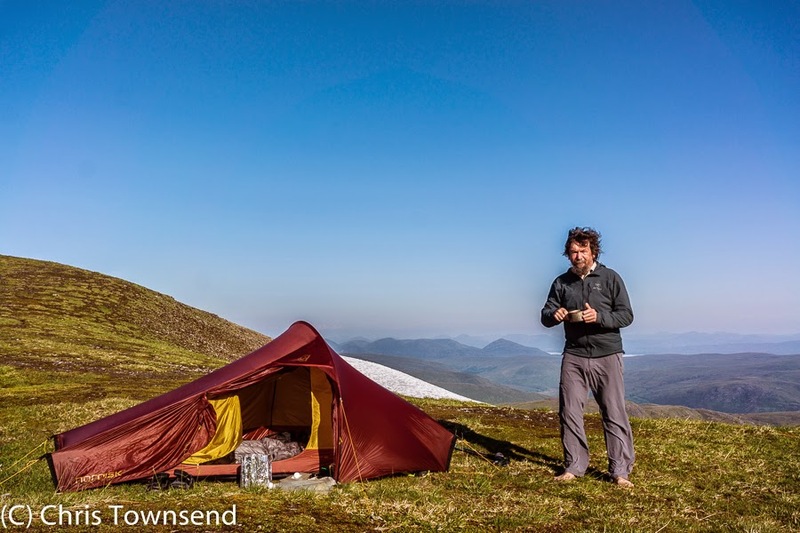 On many occasions I’ve turned away from planned summit camps to look for somewhere sheltered. At other times though I’ve not intended camping on summits but fortuitous circumstances have led me to do so. 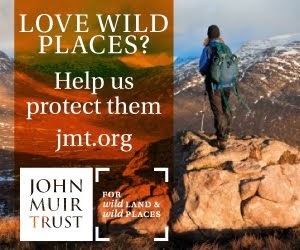 Such was the case on the TGO Challenge in 2008 when I camped on the summit of Ben Nevis. This had not been in my route plan (and might have attracted comments from vetters if it had been!) and only grew as an idea as I approached the snow-capped mountain from the west. 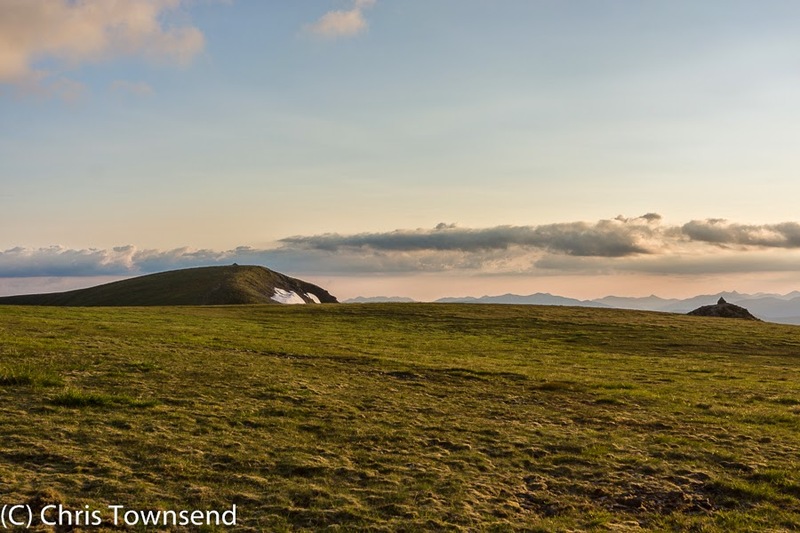 The summit of the Ben is a vast rock field with nowhere for a comfortable camp and no water. Snow however can make a comfortable bed and can be melted. Leaving Fort William on a sunny evening I climbed to the summit, passing many people descending, most of whom looked puzzled at seeing someone heading up that late in the day. Many warned me of the time and the snow on the summit. 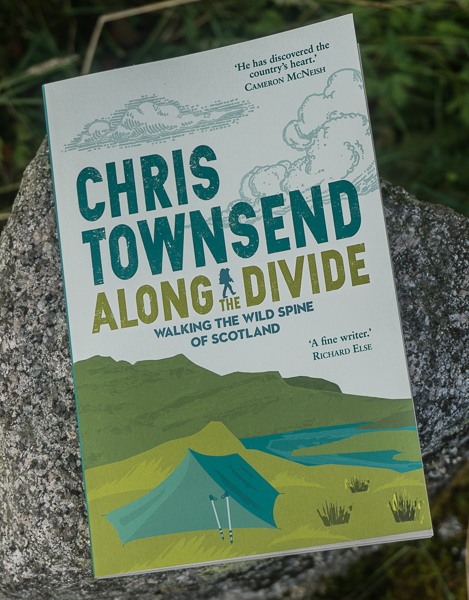 (Heading up late for a high camp does disturb some people – many years ago I was stopped by a walker in the Lake District who was furious that I was going up in the evening despite my big pack, informing me that I was both inexperienced and irresponsible). On Ben Nevis I think the fact that I was wearing sandals shocked some people too. As it was, by the time I reached the summit plateau and the snow I was alone. Unusually the weather was calm and I was able to sit outside the tent for supper and then wander along the summit edge as the sun set. The cliffs turned a rich shining russet colour and far below Loch Eil glowed gold below the pink of thin clouds in the west. A half moon rose in the sky and the first stars appeared. All was silent. I felt both excited and peaceful at being there in perfect conditions. Dawn came with wet mist and a gusty wind but the sun soon burned the dampness away and I was looking down on cloud-filled glens. 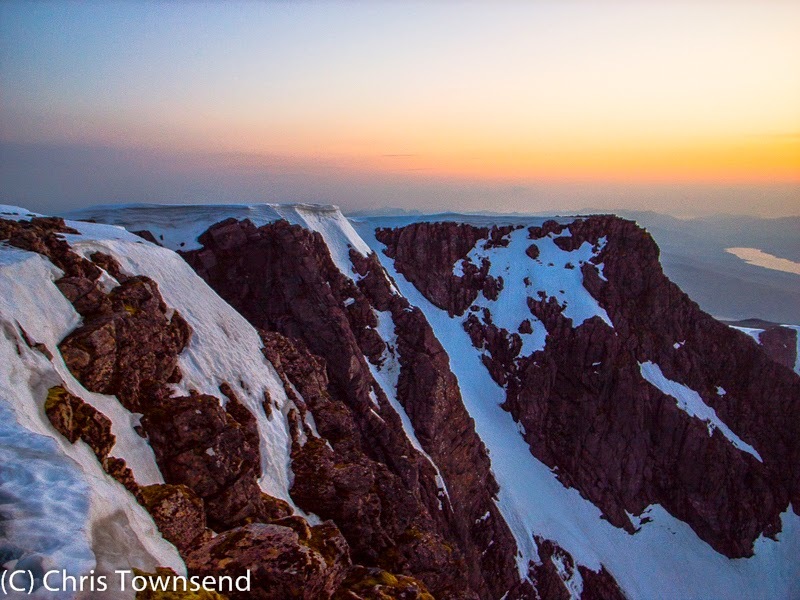 After 14 hours alone on the summit I departed along the Carn Mor Dearg arête, still marvelling at my wondrous night. Spending a night on a mountain can mean waking to a storm, perhaps in the middle of the night. 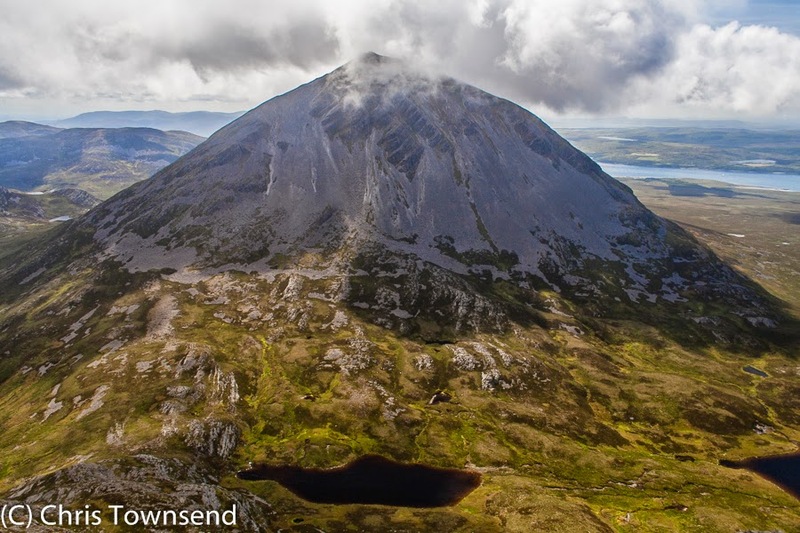 On Coinnich Mhor, one of the subsidiary summits of Beinn Eighe in Torridon (and whose name means “big moss”, a hint that it might make a good camp site) I was woken at 4.30 pm by heavy rain lashing the tent. Everything was damp with condensation running down the walls (a situation made worse by the fact that I was testing a not very good single skin tent – gear testing isn’t always fun!). I unzipped the door and looked out only for my head lamp beam to bounce back at me from the thick clouds surrounding the tent. I felt disappointed. 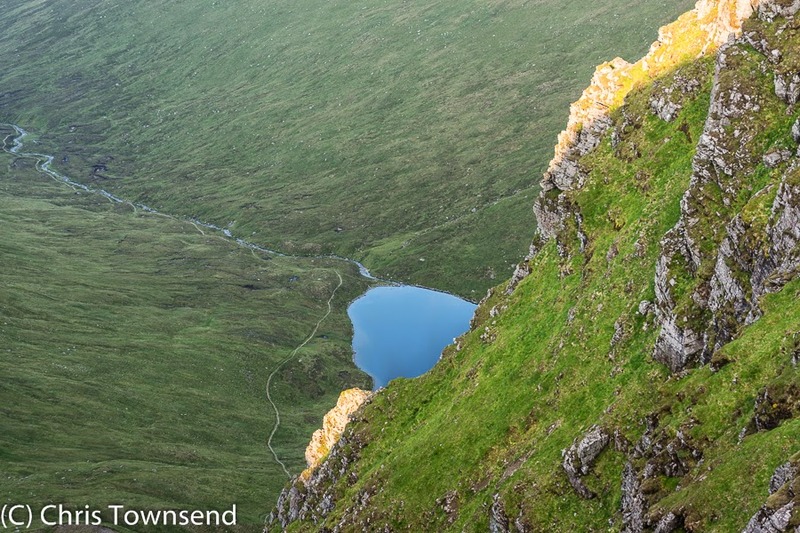 I’d climbed Coinnich Mhor on a fine evening with a forecast for a clear night and sunny weather. 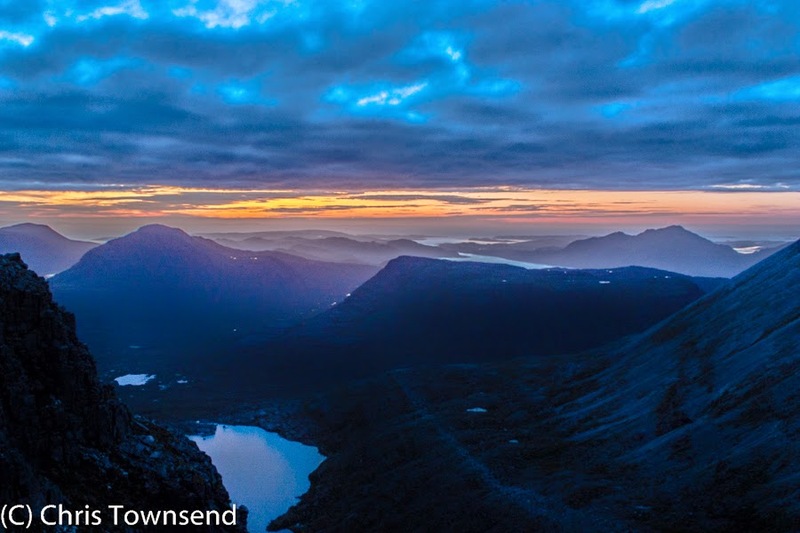 There’s been a red sky at dusk too, with lovely colours over the hills of Fisherfield and pointed Ruadh-stac Mor, the highest peak on Beinn Eighe, which lay not far away. The rain didn’t ease despite the forecast and the next day was one of low cloud and downpours. 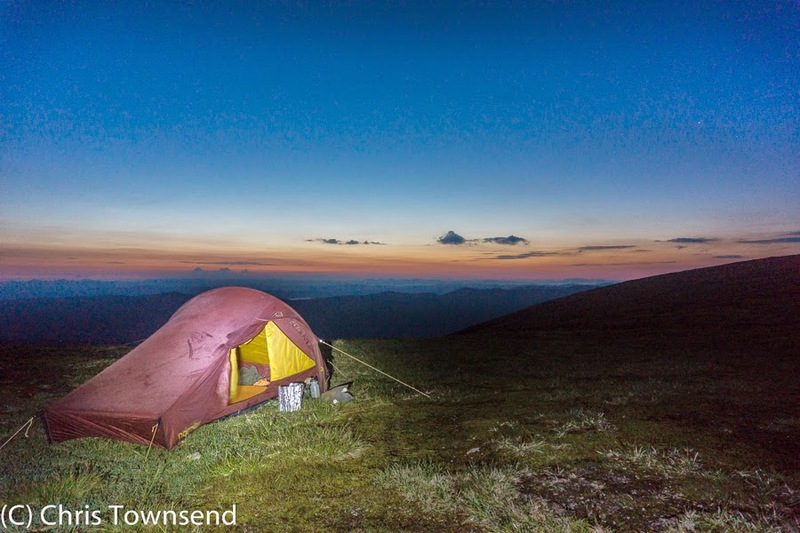 The evening light had made the high camp worthwhile though (and I now knew a great deal about that tent!). There’s no need to climb the highest peaks for wonderful summit camps though. 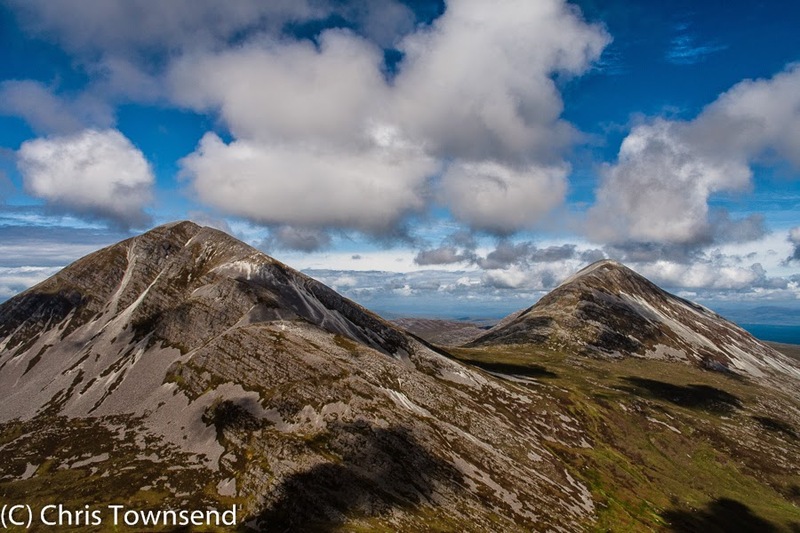 Lower peaks can offer just as splendid views and just as remote and wild a feel. 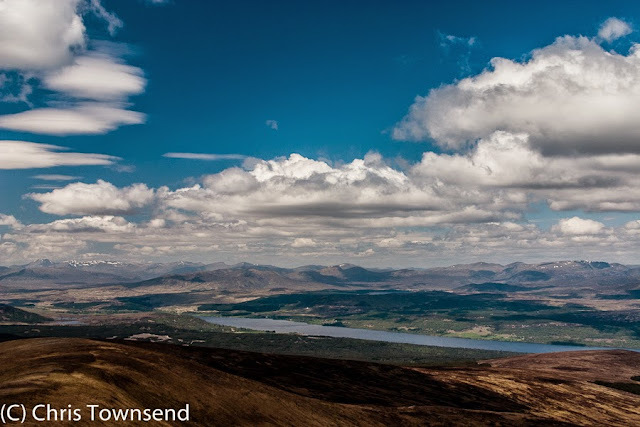 North-west of Ben Nevis across the Great Glen lies a long flat-topped hill called Druim Fada (which means long ridge). 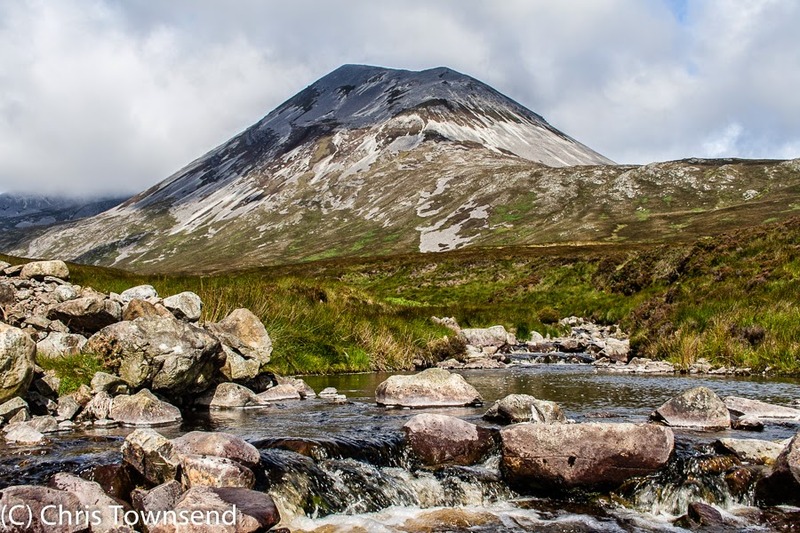 The high point of only 744 metres is at the east end of the hill and is called Stob a’Grianain where I camped, a few yards from the summit, one early autumn evening after a long day. The weather was sunny but there was a cold west wind that kept the air sharp and clear. Below I could see Corpach and Fort William with Ben Nevis and the Mamores rising above them. In daylight the towns looked rather mundane. Looking away from them to the west all I could see was hills and glens. The feeling was one of being on the edge of the wild, between the worlds of civilisation and nature. As the sun set and the light dimmed the landscape became more mysterious and atmospheric. Ben Nevis glowed in the low late rays of the sun. 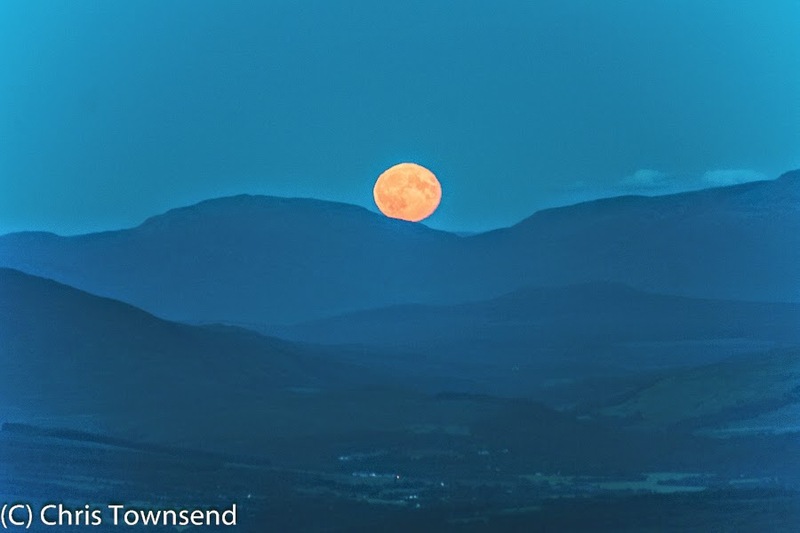 Then a full moon, huge and orange, rose over the misty pale landscape of the Great Glen. The towns became daubs of bright lights, decorations rather than real places even though I could hear traffic whenever the wind paused. At dawn the towns were in grey shadow and Ben Nevis was cloud-capped but out west the sky was red and golden and pale mist filled the glens below the purple shaded hills. The day was hazy and dull but again it was the night that had worked magic. 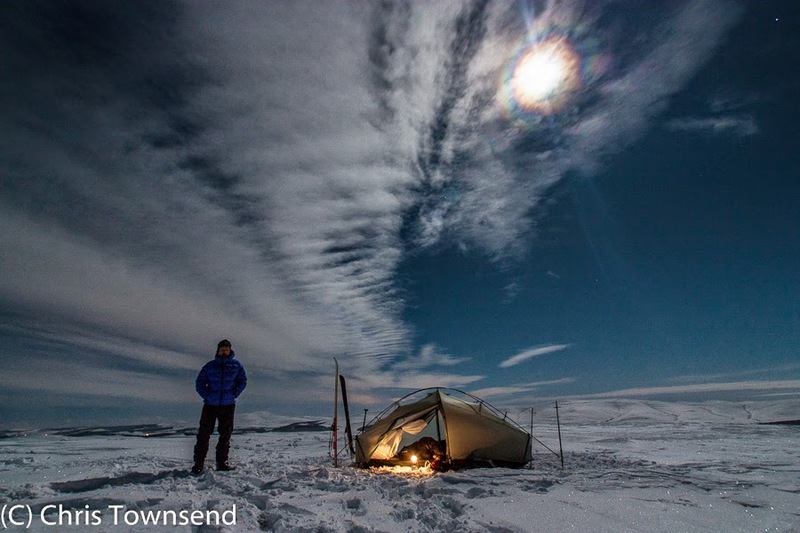 Winter is a more serious time for high camps as nights are long and cold and storms severe. Snow can transform undistinguished hills though and make camping on them an exciting adventure. 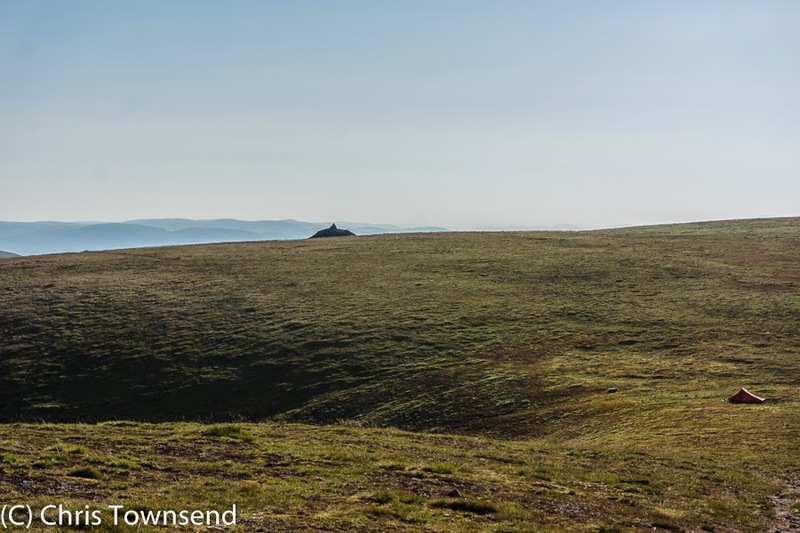 One February, when deep snow lay from glens to the summits, I went from my front door up little Carn na Loine, a heathery bump just 549 metres high in the far north-east corner of Cairngorm National Park. Snow free, this is a rolling moorland hill managed for grouse-shooting. Under snow it was more like an arctic wilderness. The sky was overcast as I pitched camp but at dusk the sun sank below the cloud, turning the snow pink and the western sky red and orange. Night brought a clearing sky, a full moon, stars and a temperature of -8ºC. I was glad of my down jacket as I stood outside watching the wildness and listening to the silence. Home was just a few miles away but it could have been on another planet. Indeed, it seemed as though it was. The world of the summits is different. 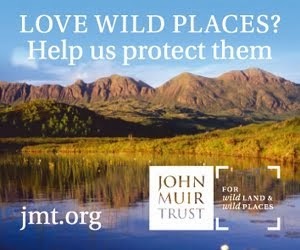 Camping there takes you into a special place where the flatlands can be forgotten and wildness embraced.